It’s not quite officially summer – but it is FINALLY starting to feel that way (at least in our neck of the woods) and the sunshine is much needed! The sunshine has us thinking about summer birthdays…pool parties, bbq’s, picnics, spending time with family and friends and of course, celebrating the Fancy way with fabulous treats and colorful decorations. We’ve partnered once again with our good friend ArtGirl TM who is creating handmade sets of six sugar cookies shaped like candles and shipping them in a cute gift container. These colorful cookies measure approximately 4″ tall, are made with all natural ingredients and are NOW available on our website. Perfect when your your in a pinch and looking for a pop of color for a party. They are almost too cute to eat…almost! We love the idea of popping them in a batch of cupcakes decked out in colorful baking cups to match! We love ArtGirl and her fun website…check it our for decorating inspiration! Iif your up for an afternoon project – try your hand at making candle shaped cookies at home with our Candle Cookie Cutter, No Fail Sugar Cookie Recipe and a batch of royal icing. YUM! Also for the summer birthday season we can’t get enough of Cake Pops! Sure -they are all the rage, but for good reason! Look how festive they are decorated in rainbow colors, sprinkled with white non-pareils and dressed up with a Happy Birthday Cake Pop Skirt? Also just in are some fantastic options for birthday candles. From fancy Candelabra’s and Match Stick Candlesto these Firecracker Birthday Candles and these clever Roman Numeral Candles…there is something for every birthday party! 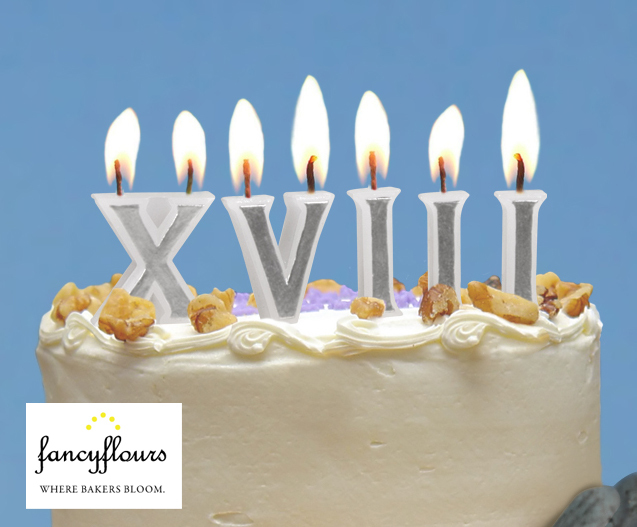 The Roman Numerals come in a pack of 8 are are way more fun and keep folks guessing your age – I mean doesn’t a giant L look much better than a giant 5-0! See our entire Candle selection HERE.